[ Sir Henry Ellis, Principal Secretary of the British Museum. ] 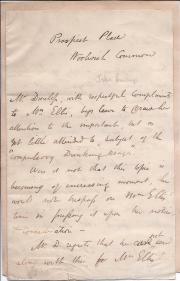 Autograph Note Signed ('Henry Ellis'), regarding the 'recommendation to our Reading Room' of 'Mr Justice Norton'. British Museum [ London ]. 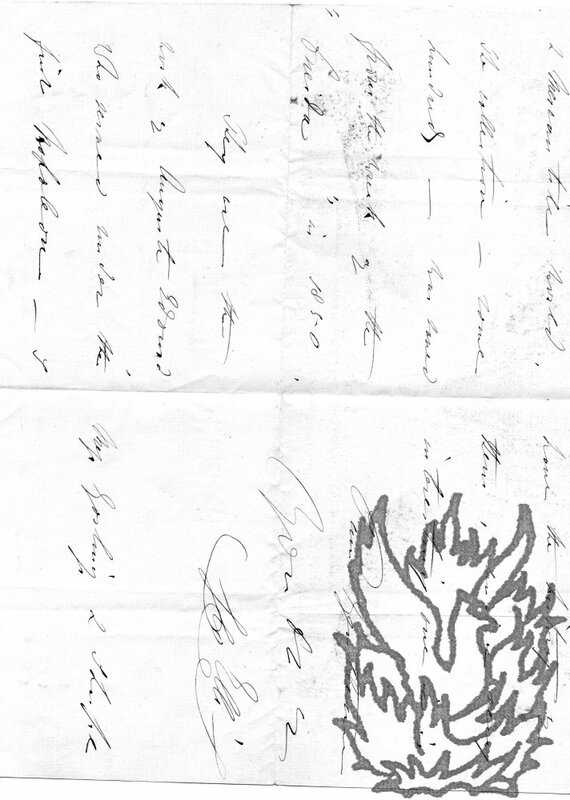 12 September 1842. 1p., landscape 12mo. 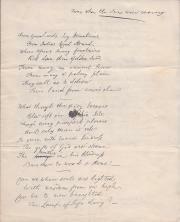 In fair condition, on aged and worn paper, with closed tear and tape stain at head. Reads: 'British Museum | Sept. 12. 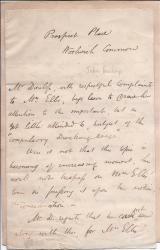 1842 | My dear Sir | I was not at home when Mr Justice Norton presented your Note of recommendation to our Reading Room. I lose no time in enclosing a Card for him, with our Regulations. | Yours very truly | Henry Ellis'. [ Sir Henry Ellis, Principal Librarian of the British Museum. ] Autograph Letter Signed ('Henry Ellis') to Edward Magrath, thanking him for his good offices. 1p., 12mo. In good condition, on lightly-aged paper. 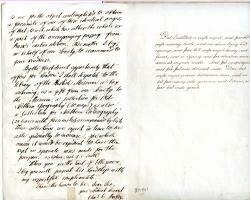 He thanks him for 'the promptness with which you placed my request on behalf of Mr. Tennent before the Library Committee'. 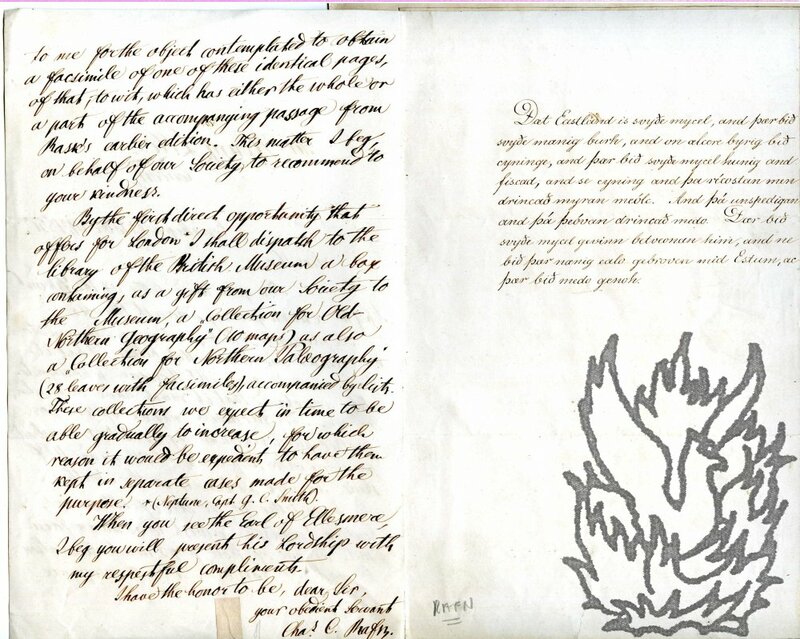 Tennent will himself thank Magrath 'for the obliging offer of the use of your private Room'. In another hand at bottom right: 'Librarian British Museum'. [ James Gardiner. ] Typescript of '"Small Hotel" A Comedy in Three Acts by James Gardiner'. With Typed Letter Signed to Commander Vivian Ellis from Olive Harding of Myron Selznick (London) Ltd. The play is undated. [ 56 Welbeck Street, London? ] Harding's letter on letterhead of Myron Selznick (London) Ltd; 23 January 1946. ONE: Typescript of '"Small Hotel" | A Comedy in Three Acts |by | James Gardiner'. 144pp., 4to. Bound with ribbon in blue card wraps with typed label. Text on rectos only. In pencil on title-page: '56 Welbeck Street'. In fair condition, on aged paper, in heavily worn wraps. 'The action takes place in the Lounge of the Bay View Hotel, near Dormouth, a South Coast Naval port.' No record of the play has been found, either on OCLC WorldCat or on COPAC, or on the ITDb. 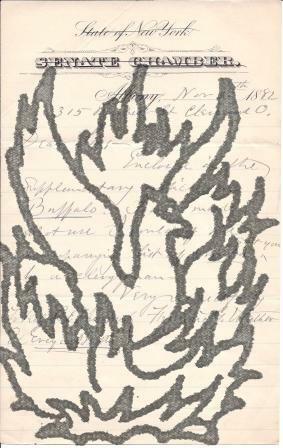 TWO: Typed Letter Signed to Commander Vivian Ellis from Olive Harding of Myron Selznick (London) Ltd.
 + 74pp., 4to. On 78 pieces of paper, bound with metal clasp in blue card folder, with white paper label with title on front cover ('THE DESERT MINSTREL | AND | OTHER POEMS | BY | VINCENT LOCKE ELLIS') and second label with address on inside front cover. In good condition, lightly-aged, in aged and worn folder. 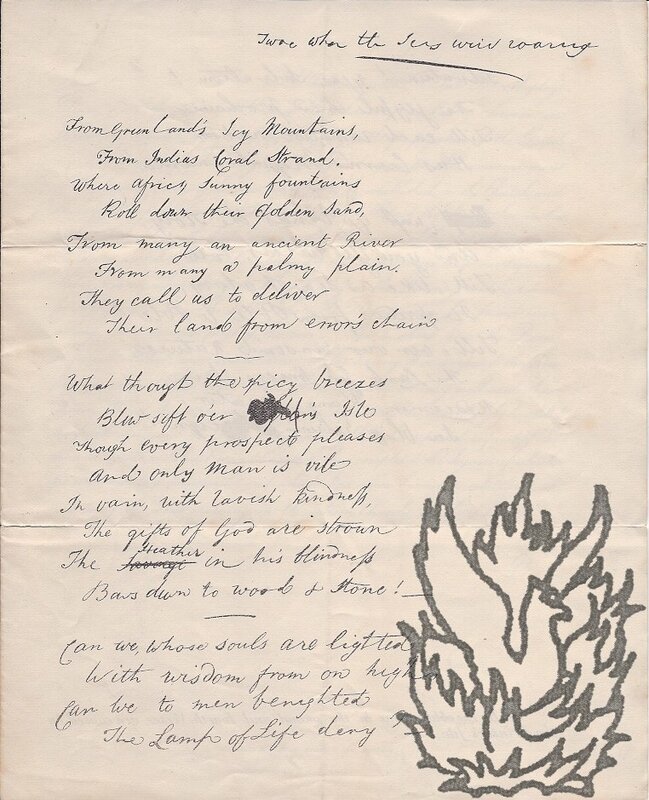 In worn manila envelope, with note by R. P. Lister (see below) reading: 'Typescript of collection of poems (unpublished) by Vivian Locke Ellis'. Three-page 'Index' gives the titles of the 69 poems, beginning with 'To W. de la M. [i.e. Walter de la Mare] from V. L.
Autograph Letter Signed from the journalist and author Peter Bayne to an unnamed recipient, stating that he cannot try his hand 'on Byron or Browning [...] without more chance of continuous work'. 33 St. Julian's Road, Kilburn, London N.W. 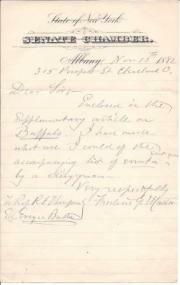 30 November 1881. Autograph Letter Signed from American journalist Ellis Paxson Oberholtzer to 'Mr Kennedy', regarding a portrait of quaker classicist Robert Proud in the Historical Society of Pennsylvania, with appended note on the painting, presumably by Kennedy. On letterhead of The Franklin Inn Club, 1218 Chancellor Street, Philadelphia. 20 August 1907. 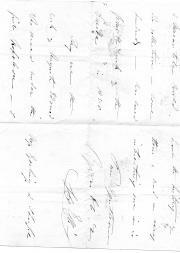 Autograph Letter Signed ('Willm. Murdin') from the historian William Murdin to Dr Samuel Johnson's friend the scrivener and author John Ellis, on the nature of friendship. St John's College, Cambridge. 19 November 1721. 1p., 8vo. Bifolium. Twenty-seven lines of text. Good, on aged paper, with minor traces of previous mounting. Addressed, with black ink circular postmark ('20 | NO'), on reverse of second leaf, ''To Mr Ellis | att Mr Taverners in Thread-needle Street'. 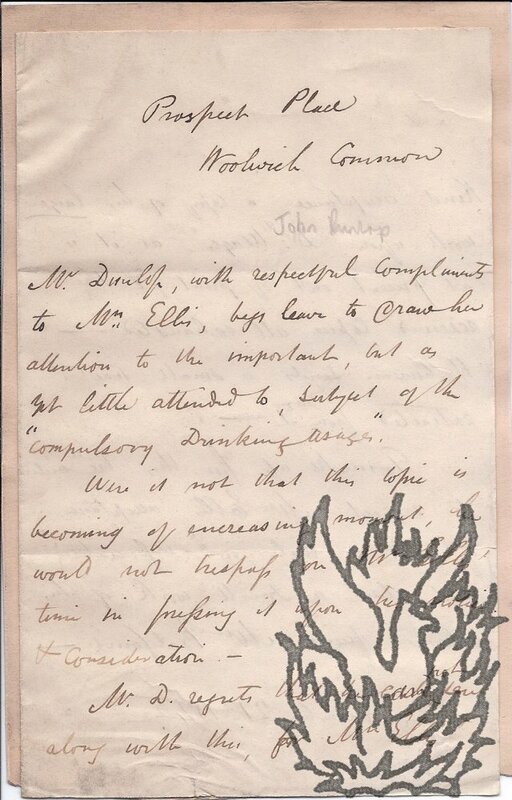 The letter begins: 'Nothing can yield Persons in our Stations greater Satisfaction, than to be entertain'd in our silent Retirement with some harmless amusements from a facetious & learned Correspondent. 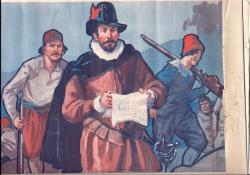 Five coloured posters by Australian artist Ellis Silas, each in the style of a frieze or panorama, depicting eleven 'British' explorers, from the Cabot brothers to Captain Oates, before scenic backgrounds. The five posters, presumably produced for the classroom, are scarce, with no reference to them on the internet or elsewhere. They are attractively painted in a bold and vivid panoramic frieze style. Each carries a single illustration showing two (counting the Cabot brothers as one) explorers in front of groups of men, with a merged background behind them. Autograph Signature ('Henry Ellis'), of Sir Henry Ellis, Principal Librarian, the British Museum, on part of letter to James C. Webster. On rectangle cut from letter, 3.5 x 11 cm. In fair condition, on lightly-aged paper, with neat vertical crease at one edge (away from signature) and minor traces of previous mounting on reverse. Reads '<...> to his Admission. | Believe me very faithfully Yours, | Henry Ellis', with reverse reading '<...> now with my Successor, Antonio Panizzi Esq | James C. Webster Esq'. From Webster's autograph collection.